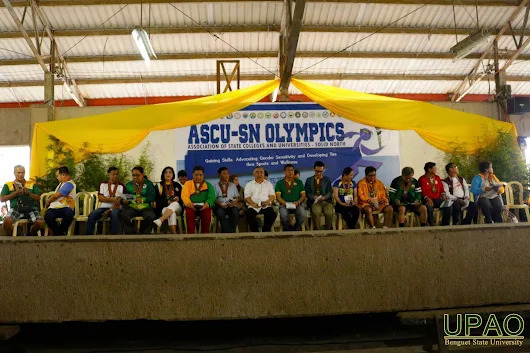 To promote camaraderie and friendly competition, the Association of State Colleges and Universities – Solid North (ASCU – SN) held its Athletic Olympics on June 19-21, 2018 with Benguet State University as the host. Twenty–two State Universities and Colleges’ (SUCs) employees and staff started off with a parade to the BSU Covered Court and held the opening program with the theme, “Gaining Skills, Advocating Gender Sensitivity and Developing Ties thru Sports and Wellness” in the morning of June 19. In his welcome remarks, BSU President Feliciano G. Calora, Jr. said that the University is working closely with local government units to give back to the communities from various municipalities of the province. He added that it is an honor to hold the ASCU – SN Olympics to promote camaraderie among SUCs. “Each of our universities has its own specific specialization. That’s why we like to work with you in terms of research so that we can all see through the research in the Philippines and the research paradigm that we currently have,” said Calora. La Trinidad Mayor Romeo K. Salda welcomed the ASCU – SN participants and assured of their safety within the municipality. Benguet Governor Crescencio C. Pacalso also boasted of the province’s tourism spots and products that the ASCU – SN participants can enjoy. He bade the athletes good luck and wished them well. Dr. Ryan C. Guinaran, BSU Board of Regents – Private Sector and guest speaker emphasized the importance of sports diplomacy and gender sensitivity in playing the games. He started off his speech with a story called the Legend of the Apesang Rock. In the story, the smallest among the three birds, destroyed the Apesang rock that would help the community. The smallest bird was a female and from there Guinaran stated his points. “It’s about gender sensitivity, tiktik (name of the bird) was the smallest, the most powerless, the woman, among the three,” said Guinaran adding that each individual regardless of sexual orientation should be given the opportunity to look at their potential. Guinaran also related the story of how North Korea and South Korea decided to unite, and its reason for doing so is the Winter Olympics on February this year. Guinaran pointed out in his speech that the ASCU – SN is a medium to penetrate the interpersonal barriers between employees through sports and friendly competitions. “So this is the time for us to be more efficient, to be develop as a team. Because we are not here really to compete, but we are here to complement. We are not here to suppress, but are here to supplement. And if you have to compete, compete only in one way, and that is to be the best team player in your school,” Guinaran concludes. Ryan B. Batinay, a faculty of BSU lit the symbolic urn, oaths have been spoken, and with ASCU – SN President Eduardo T. Bagtang announcement, the ASCU – SN Olympics is declared open. After three days of friendly competition, BSU reigned supreme with 20 gold, 13 silver, and ten bronze medals; following them is Don Mariano Marcos Memorial State University with 12 gold, 12 silver, and 13 bronze medals; and ranking third is the Mountain Province State Polytechnic College with six gold, eight silver, and nine bronze medals.